On these 18 day South Africa Tours we go of the beaten track and still visit the highlights of “the world in one country”. Clients overnight at comfortable lodges in pristine reserves, high in the mountains, or on the beach and always in truly unique surroundings. The tour is enjoyed by those with an adventurous heart and a flexible attitude. International groups. Included highlights: “Big Five” walking safari, open vehicle game drives (safari), wild life reserves/ national parks, Kruger National Park, Zululand wild life Reserve, Drakensberg Mountains, Swaziland Kingdom, Cape wine farm, African Culture, Garden Route, coastal hike. Accommodated (hotels/ lodges): Clients overnight in a comfortable twin rooms or permanent safari tents, mostly with en-suite bathrooms. As described below. 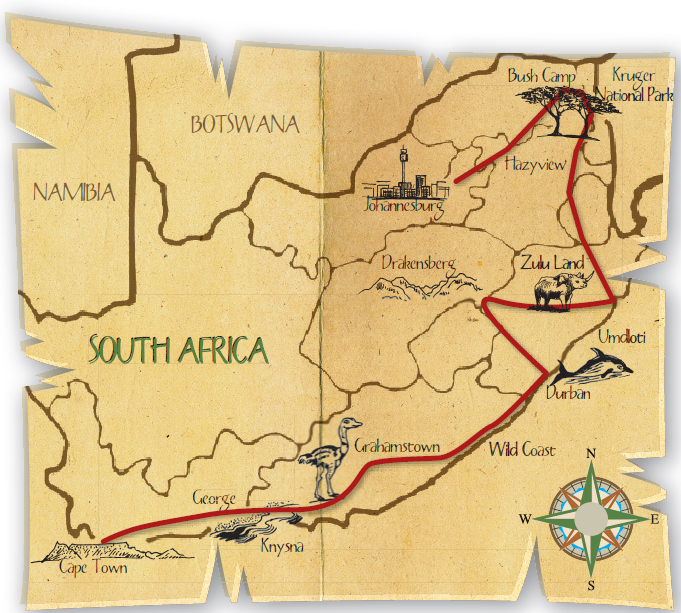 The South Africa Tours start once we depart from Johannesburg at 06:30 as we set off on the scenic road to Mpumalanga. A brunch stop in the historic Dullstroom will be enjoyed before we wind our way down the Drakensberg escarpment and into the untamed Lowveld. The next two nights will be spent at our well-appointed Bush Lodge which is situated in a private reserve within the greater Kruger National Park, an area where animals roam naturally and unrestricted. The tented Lodge blends into the bush and offers comfortable beds, en-suite bathrooms, a refreshing splash pool, and stunning views over the surrounding wilderness. Dinner tonight is cooked in the traditional manner over an open fire. As is custom in the bush, we start the day with coffee and rusks before embarking on a game walk. Although we will walk for some three hours, the purpose is not to cover distance but rather to search for animals and in so doing, to learn more about the ways of the bush. A guide and / or tracker lead all walks. Before the heat of the day, we return to the Lodge for a sumptuous brunch after which it’s time to relax around the Lodge and to enjoy the serenity of the surrounding wilderness. In the afternoon we conduct an open vehicle game drive (safari) which develops into an extensive night drive all the time searching for animals. Being in the bush at night provides us with the opportunity of viewing nocturnal animals. This evening we enjoy a hearty bush “braai” (BBQ) cooked on an open fire. Fall asleep to the sounds of the wild. Rising with the African sun, we will enjoy a hearty breakfast before setting off to explore the highlights of the Panorama Route. Our first stop will be to view the impressive Blyde River Canyon, then on to Bourke’s Luck Potholes, Gods Window, and the cosy little town of Graskop where we will enjoy an own expense lunch at Harry’s Pancake Bar. This afternoon we descend the Kowyn Pass to a traditional village where we will spend some time with the local Shangan people. After a full day, we make our way to our lodge in Hazyview, a log cabin built spectacularly on stilts in the indigenous forest on the banks of the Sabie river – we will spend two nights here. An early start, we depart at sunrise and travel the short distance to enter the southern sector of the Kruger National Park for a full day of safari (game viewing). Slowly traversing in search of the many animals that inhabit this area, we enjoy the high vantage point and comfort of our well-equipped vehicle. Although most of the day will be spent game viewing, we will stop at various designated sites to stretch our legs, to enjoy Brunch, and to wander around one of the Parks rest camps. Late this afternoon we exit the Park and return to the comfort of our lodge in Hazyview. We depart in the morning and enjoy a scenic drive south before we leave South Africa and cross the border into the Kingdom of the Swazi. A small landlocked country, Swaziland is rich in culture and natural beauty. Our journey today takes us into an area of spectacular scenery and past numerous traditional homesteads surrounded by vast fields of sugarcane. Our first destination is Sibebe rock, a granite mountain rising some 350m above the Mbuluzi valley. We spend some time here at the foot of the mountain while our guides explain more about the history and beliefs surrounding Sibebe. In the late afternoon we drive the short distance via the Capital of Mbabane to our accommodation for the night. On arrival we check in and enjoy a catered meal. Today we follow the winding roads through Swaziland and cross back into South Africa in the late morning. After completing the border formalities, we enter Zululand, an area once ruled by the infamous Shaka Zulu. The reserves in this area are lush and offer protection to a variety of indigenous animals including Black and White Rhino. This afternoon we enjoy a wildlife experience that will allow us to appreciate the fauna and flora of the Zulu Kingdom. Traveling inland today, we pass through a tranquil region of rolling hills, but don’t be fooled, this region has hosted many historic wars – fought over time by the Zulu’s, the Boers (pioneer settlers), the British, and many others fighting for a stake in Africa. Our lunch stop will be at one of the famous battlefields in the area where we will have time to learn a bit more about this fascinating time in the South African history. This afternoon we reach the majestic Drakensberg mountain range, “Barrier of Spears”. On reaching the foothills we transfer to a 4X4 vehicle, and then enjoy an exciting drive (or walk) on mountain tracks high up to the lodge in the Drakensburg. We spend two nights here in cosy log cabins and will have a day of hiking, exploring, and simply enjoying the wonders of this National Heritage Site. A walk to the San Rock Art gallery is well worth the effort. Pony trekking is also available. A relaxed start, after a transfer (or walk) back down to our vehicle it is with new energy that we make our way toward the Indian Ocean. Our journey today will take us through the Natal Midlands where we will see many small craft shops, arts, and other attractions. We will stop for an own expense lunch near Nottingham Road before continuing to our next accommodation where two nights are spent. Your lodge on the Dolphin Coast is located literally on the beach and the sound of the waves pounding is relentless. We will have a “open” day here to spend soaking up the sun and simply enjoying the beach and warm ocean or to stroll through the village enjoying the cheerful hospitality. One night we enjoy a traditional fish braai on the Lodge’s patio. Lunch and dinner own expense. Setting off early, we will pass through Durban this morning and will then follow the coast south into an area that can only be described as one of the highlights of the tour - The Wild Coast. Having formerly been an independent homeland, there has been little development in this area resulting in endless unspoiled beaches, natural estuaries, rolling grassland, and a tapestry of traditional Xhosa villages. We will spend two nights at a remote lodge and will spend a full day exploring this rugged but stunningly beautiful area. Leaving the lush coastal forests, our first stop today will be at the Nelson Mandela museum in Umtata, then we continue past the birthplace of this great statesman. Our journey this afternoon will take us into what is known as the “Frontier Country”, a region that was settled in the 1820’s by European immigrants and that was host to many frontier wars. We spend the night in comfortable accommodation overlooking the city of Grahamstown. Entering the renowned Garden Route today, our first stop will be at the Tsitsikamma Coastal National Park. Located in a marine reserve, the hike offers spectacular views and we enjoy a walk along the rugged coast and over the suspension bridge spanning the Storms River. We spend the night in the Storms River area. The area offers a variety of optional activities for guests. Optional excursions include kayak trips, mountain bike rides in the forest, a tour of the local township, and many more (own expense). The next day guests will depart from Storms River and make their way to Knysna where they will spend the night and have time for some more activities. One lunch and one dinner will be own expense. A leisurely start, we leave Knysna to travel through the Garden Routes Lake District and then to follow the “Whale Route” through Hermanus and around the Hottentots Holland Mountains. Arriving in the “Mother City” Cape Town in the late afternoon, we check into the lodge in Cape Town which is conveniently situated. Cape Town is undoubtedly one of the most beautiful cities in the world and we will spend two full days here – visiting Cape Point, Hout Bay, The Waterfront, secluded beaches, a wine farm, and many other attractions. We will also hike up Table Mountain. (Lunches and dinners in Cape Town are own expense). This tour ends at 16:00 on day 18, however clients are welcome to extend their stay by booking post-tour nights at the lodge in Cape Town. If arranging an onward flight on this day, please allow time for an airport transfer and for check-in procedures (up to three hours). The Greenfire Lodge situated on the beachfront in the vibrant suburb of Seapoint on the Atlantic Seaboard in Cape Town. This beautiful, well - established Lodge is ideal for those wanting easy access to all of the major attractions in and around the City.